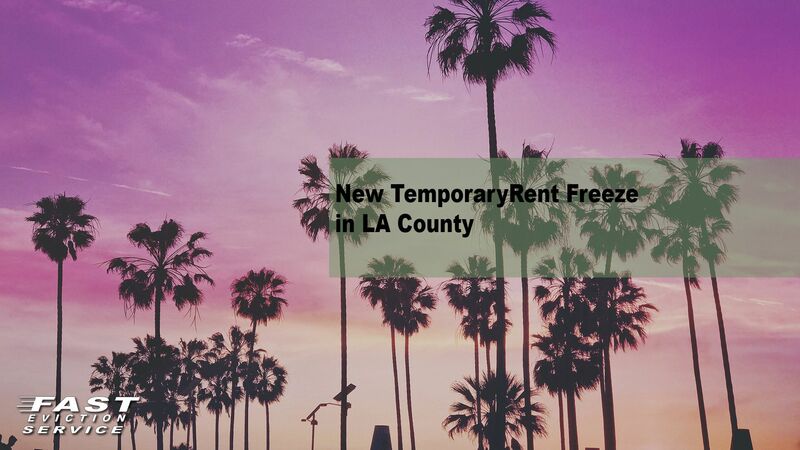 The Los Angeles County Board of Supervisors has voted 4 -1 in approval of a temporary rent control ordinance for unincorporated Los Angeles that will take effect December 20, 2018. This new ordinance will cap any rent increase to 3%, once a year and will be retroactive from September 11, 2018. It is believed that the board will eventually draft a permanent rent freeze ordinance. One thing to keep in mind is that the City of Commerce also went through a temporary freeze in August of 2017. That ordinance has been extended several times and will remain active up until March of 2019 pending another extension. Buildings that are affected by this ordinance are rentals built before 1995 in the unincorporated area of LA County. This also includes duplexes and triplexes. Visit the following link if you are unsure if your building lies within the unincorporated area. https://www.lacounty.gov/government/about-la-county/unincorporated-areas/. This ordinance does not apply to any homes or apartment buildings built in 1995 or newer. Ordinance will take effect on December 20, 2018 and will be retroactive from September 11, 2018. Landlords must now provide evidence of a “just cause” for eviction such as unpaid rent or any violation of the lease. Rent increases by any amount can be made if and when a tenant moves out voluntarily. The board has made this ordnance temporary but they have the ability to extend as many times as needed. Permanent rent stabilization is expected sometime in 2019. If you have any questions, please call us at 1-800-686-8686.